Monk, priest of the Tendai sect, Mid-Heian Period. In December 918, during the scholar of Chinese literature 三善清行 Miyoshi Kiyotsura's funeral procession over this bridge, his son Jozo, who had been a disciple at Kumano Sanzan (a set of three Grand Shrines located in the southeastern part of the Kii Mountain Range), hurriedly returned at the news of his father's death, and gave prayers to his father while throwing himself over the coffin, when a peal of thunder temporarily resurrected Kiyotsura and they embraced each other. Joozoo Hooshi no setsuwa 浄蔵法師の説話. 浄蔵説話 The Legends of Jozo-Hoshi. The Problems in the Legend of "Death of Tokihira"
His brother was the ascet 日蔵 Nichizo (905 - 967). Jozo practised unter the tutelage of 宇多法皇 Uda Tenno and then went on to Mount Heizan, later to Kumano. He was famous for exorcist rituals. When 平将門 Taira no Masakado staged a revolt in Kanto (関東で乱), he performed exorcist rituals (choobuku 調伏 Chobuku rituals). He was known for his beautiful voice when chanting the sutras (shoomyoo 声明 Shomyo). He was learned in astronomy 天文 and medicine 医薬 of his day. 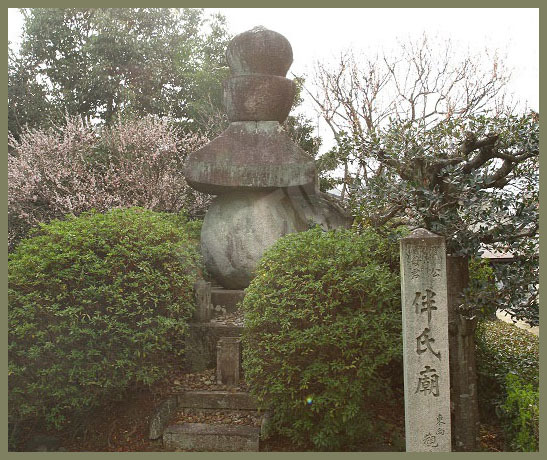 Jozo is involved in the memorial grave stone of Kitano 北野の忌明の塔. Some say he resurrected his father 清行 Kiyotsura from the dead. Jozo was very good at playing this mysterious flute. One day he was playing late at night, it was reveberating all the way to the gate 朱雀門 Suzakumon of 平城宮 Heijokyo, Nara. The monsters were enchanted by the sound and came through this gate. Jozo kept this flute as a very precious item. received a flute from the Monsters of the Suzakumon gate. When the Emperor tried to blow this flute, there was no sound. When he gave the flute to Jozo, he could play just as skillfull and gentle as Hakuga. The Emperor had called the flute "Twinleaf", because it had two leaves, one red and one green, covered with dew every morning. Michinaga later got the flute and finally it ended up in the Sutra Hall of the Byodo-In in Uji. When someone inspected it later, the leaves had dried and there was no dew on them any more. a nobleman and gagaku musician in the Heian period. He was an expert in kangen (管弦), orchestral gagaku which does not accompany dance. He attained his mastery of gagaku . . . flute from Ooishi no Minekichi, and hichiriki from Yoshimine no Yukimusa. 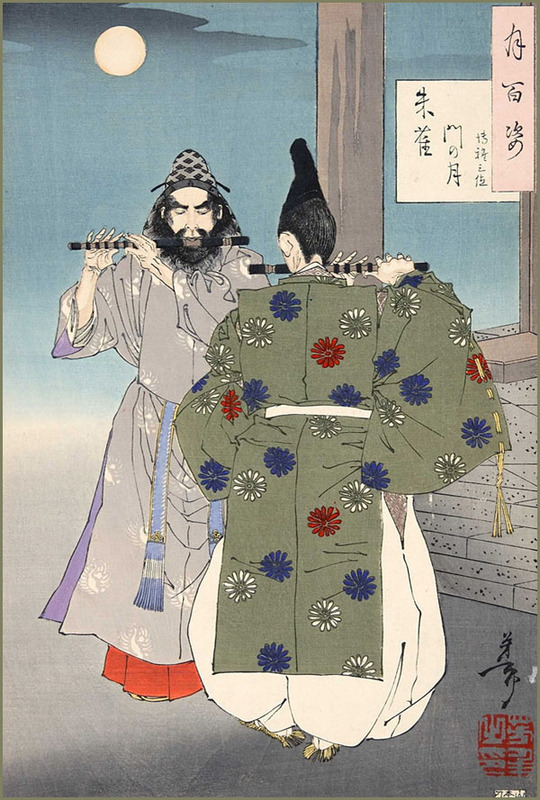 In 966, by the order of Emperor Murakami, he compiled an imperial music anthology, the Shinsen gakubu (新撰楽譜, also called Hakuga no Fue-fu meaning "Hiromasa's Flute Score"). The system of notation he developed is still used today. He received the famous flute Ha Futatsu (葉二) from the demon at the Suzakumon Gate. was the main gate built in the center of the south end of the imperial palaces in the Japanese ancient capitals of Fujiwara-kyō (Kashihara), Heijō-kyō (Nara), and later Heian-kyō (Kyoto). The placement followed the ancient Chinese palace model requirements at the time, where Suzaku (朱雀 Suzaku), the Vermilion Bird was the Guardian of the South.
. Taira no Atsumori 平敦盛 (1169 - 1184) . 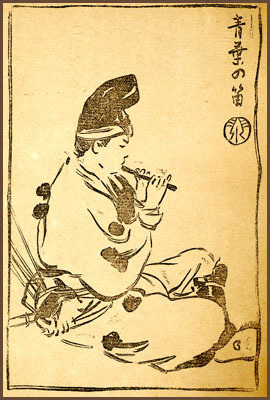 Atsumori was famous for his flute playing. 800-1200 years ago, the bamboo trees were dedicated for the Royal Palace. 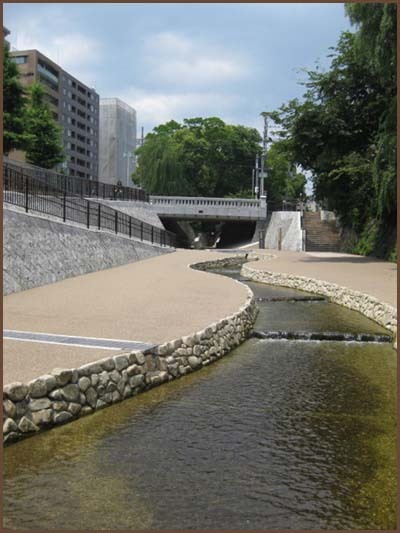 There is much forklore regarding 'Aoba-no-fue' in various place in Japan. Aoba-no-fue means the flute with green leaves. One mention in the 'Heike-monogatari', a flute owned by famous Samurai in Heike-family 'Atsumori', one more 'Aoba-no-fue'. Several years ago, 'Forum Aoba-no-fue' was held in Izumi-mura, Fukui-prefecture. They reported that there are numerous old flutes called 'Aoba-no-fue' in various places in Japan. And that about a thousand years ago, 'Aoba-no-fuetake' the material of 'Aoba-no-fue' are dedicated to Royal Palace for a long time. 'Aoba-no-fuetake' is existant still now in Hie-temple in Kokubu-shi, Kagoshima. According to the Senjusho, Miyoshi Kiyotsura’s funeral procession crossed this bridge, and his son, the priest Jozo from Kumano Province, who missed his father’s last moment, just joined the procession on the bridge. All of a sudden, the corpse of the dead father came to life briefly . Jozo could do a formal farewell to the father. After this incident in the Heian Period, the bridge was believed to connect to the another world　and had been called as Modoribashi or the 'returning bridge'. In the year 947 the pagoda of the temple Hokan-Ji, Yasaka no To, began to lean toward the side. So the high priest Jozo of the Tendai sect was called to perform some rites. His wonderful clear voice was heard far and wide in the capital.